2018-S1x & S6x, 2018 ALA U.S. Spring Charity Seal Sheet Collection. Issued 2018 by the American Lung Association (ALA). One sheet for each of the two (2) similar sheets of U.S. Spring Charity Seals issued in 2018. 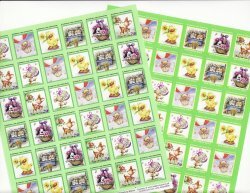 2018-S1x & S6x, 2018 ALA U.S. Spring Charity Seal Sheet Collection, VF, MNH. Issued 2018 by the American Lung Association (ALA). One sheet for each of the two (2) similar sheets of U.S. Spring Charity Seals issued in 2018. Both sheets designed by Artwork by Makiko. Both sheets have similar images of bunny carrying Easter Egg, bear in hot air balloon, chick with flower, basket of kittens, puppy in basket, fawn and chipmunk. With text " American Lung Association" at top of each seal. The exceptions are that on the 2018-S1x sheet, the images are framed in green with the text "American Lung Association at top of each seal. While on the 2018-S6x sheet, the images are framed in yellow with the text "American Lung Association at top of each seal, and the text "2018 Spring Seals" on the bottom of each seal. Spring Charity Seals are also known as TB Charity Seals, and are usually classified as Charity Seals, or Cinderella Stamps.